New York (PTI) (The Hindu, June 10, 2008): A US-based NGO has launched a campaign for designating the Gulf of Mannar, which includes Ram Sethu that is at the centre of the controversy in India over construction of a ship canal project, as a UNESCO World Heritage Natural and Cultural site. In a statement, the Living Planet Foundation said the site fulfils the criteria and requirements set forth in the World Heritage Convention. The designation would assist in the protection of the first marine biosphere reserve in all of South and Southeast Asia, it said. The Foundation claimed that its activists have submitted petitions to the Indian embassy and consulates in the United States. In a letter to Prime Minister Manmohan Singh, the Foundation said the declaration of Gulf of Mannar as World Heritage Site would enhance India's prestige. HOUSTON: The Living Planet Foundation of USA, in association with a number of international organizations has launched a worldwide campaign to have the Gulf of Mannar designated as a UNESCO World Heritage mixed Natural and Cultural site.A delegation from the Campaign met with S.M. Gavai, Consul General of India at the India Consulate General Houston, Texas and handed him the Campaign's letter addressed to the Indian Prime Minister Manmohan Singh. Founders of the Campaign believe that the Gulf of Mannar which includes Ram Sethu (Adam's Bridge) fulfills the criteria and requirements set forth in the World Heritage Convention for designation as a World Heritage Site. This designation would assist in the protection of this first marine Biosphere reserve in all of South and Southeast Asia located on the southeastern tip of India in the state of Tamil Nadu.The Campaign is urging people of all walks of life to appeal the Government of India to petition the United Nations Educational, Scientific and Cultural Organization (UNESCO) to declare the Gulf of Mannar a World Heritage Site. The meeting covered a range of topics, including the importance of the Gulf of Mannar as an ecological and environmental hotspot, the cultural and religious aspects of Ram Sethu (Adam's Bridge) and the thorium deposits of the region. Gavai gave a clear declaration from him that the ecological and environmental aspects of the Gulf of Mannar must not be ignored. He promised to look into the matter and also expressed a keen interest about the Thorium deposits in the region of Mannar and its potential as India's nuclear energy resource.In other parts of the world, volunteers from the Campaign handed petitions to the Indian Embassy in Washington, D.C. and Consulates in Chicago and Toronto. WORLD CELEBRATES RAMLILA: Playing music on wooden instruments is Cambodian way of paying homage to the gods. Bhopal: In an answer from the ruling state BJP government to those behind the controversial Ram Setu affidavit, troupes from eight different countries will be participating in a nine-day long festival that will stage the different forms of Ram Lila. Troupes from Cambodia, Bali, Sri Lanka, Java, Thailand and Singapore have all arrived in Bhopal to enact the eternal battle between good and evil. “Lord Rama is India. Without him India is nothing. Not just India, Ram Lila is staged in other parts of the world too. Therefore, we have organised this festival to tell the reality to those people who, through an affidavit, questioned the existence of Lord Rama,” Madhya Pradesh Chief Minister Shivraj Singh Chouhan says. In Cambodia, Rama is known as Pharash Ream and Ravana as Krong Reap. And Cambodians pay homage to their gods by playing music on wooden instruments. Meanwhile, for the ruling BJP, turning their focus to Ram in an election year, is yet another attempt to consolidate its core strength. "It is not just the BJP. Gandhiji also remembered Rama and introduced the concept of Ram Rajya," BJP President Rajnath Singh says. 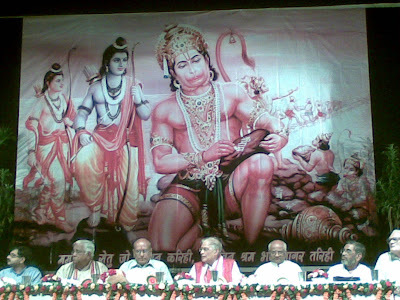 The multi-cultural Ramayana is being staged in Ujjain, Gwalior and Bhopal. Dr. S. Kalyanaraman, President of Rama Setu Raksha Manch and Director of Saraswati Shodh Sansthan, received the 19th annual Dr. Hedgewar Praj~na Samman award. 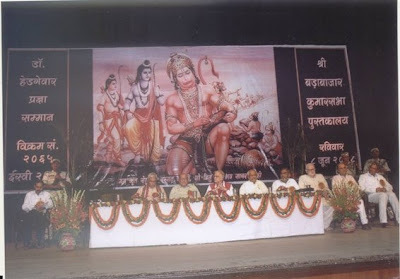 Former Union Minister Dr. Murali Manohar Joshi presided over the function held at the Kalamandira Prekshagriha. 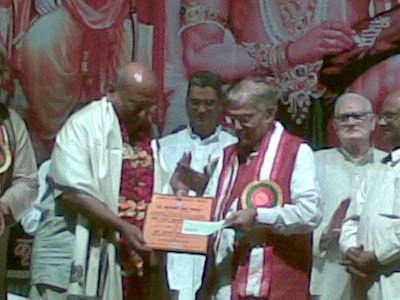 The award is given every year to an eminent scholar for lifelong contribution to Indic research by Shri Burrabazar Kumar Sabha Pustakalaya Kolkata and consists of a citation, a memento and Rs 51,000. Dr. Kalyanaraman, was given the award for his path breaking work towards researches in Saraswati Civilization and for his efforts in Rama Setu Protection Movement. Born on October 20, 1939 at a village under Tanjor district of Tamil Nadu Dr Kalyanraman completed BA from Annamalai University in 1958. He joined the Accountant General Office of Bangalore after his father’s demise. He also worked as the Chief Controller of Accounts (Karnataka Electricity Board) and a financial advisor in Railway Board till 1978. He then took up an assignment in the Asian Development Bank as a senior officer till 1995. During this period he toured 29 countries of the world and monitored 650 developmental projects. He did his Ph.d in Public Administration in 1982. He also played a key role in computerisation of the Indian Railways. With the inspiration of the late Shri Moropant Pingle, Dr Kalyanraman joined him in the Saraswati river research project. He took voluntary retirement from the Asian Development Bank five years before the actual retirement. While working with the project he not only discovered the flow route of Saraswati river but also materialised it practically at some places. Dr Kalyanraman wishes to irrigate additional nine crore acre land of the country while connecting Brahmaputra and other rivers. He has authored a five-volume book on Sindhu script and 8-volume book on Saraswati river civilisation. Earlier he was also honoured with Vakankar Award in the year 2000. 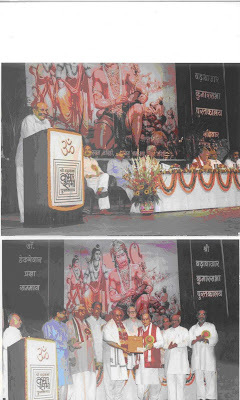 Speaking at the function, Dr. Kalyanaraman narrated how after being inspired by Shri Moropant Pingale, both of them took up the Saraswati Research and extensively traveled in the interiors of Rajasthan, Gujarat, Haryana and Himachal, to trace the path of Saraswati River that dried up five thousand years ago. Speaking in Hindi, he narrated many mesmerizing details about his research. He also shared with audience the status of Ram Setu Protection Movement, and described in detail how the legal battle is progressing. He also added that the real battle will be won not in court rooms, but on roads. Dr. Murali Manohar Joshi who handed the award, also spoke recounting how when he was the Union Minister for HRD, the government had initiated projects to discover the new facets of Indic Culture and how these were branded by the left-secular media as saffronization of Indian history. 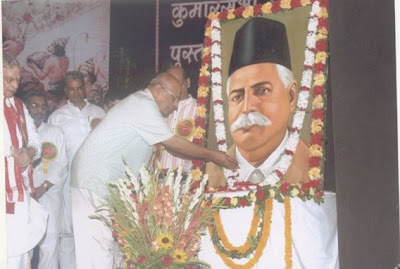 Shri Suresh Soni, the saha-sara-kaaryavaah of RSS, was the chief guest of the function which was also attended by Shri S Vedantam, the Working President of VHP, Shri Tarun Vijay, director of Dr. Syama Prasad Mookerjee Research Foundation, the office bearers of the library and general public. Visit this site tomorrow for images and videos.